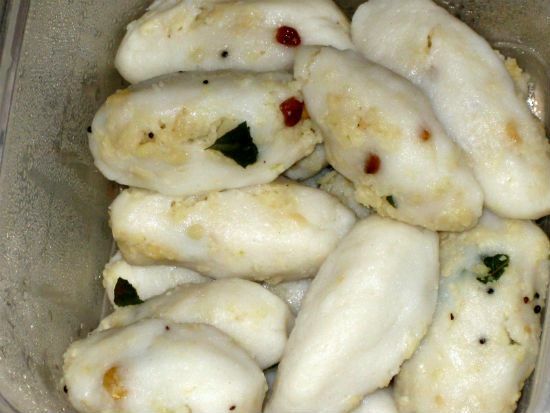 Uppu Kozhukattai (or Uppumavu Kozhukattai) is a savoury kozhukattai (modak) made during Ganesh Chaturthi. 1. Soak and wash the rice. 2. Spread it out to dry and grind to a smooth flour. 3. Soak the dal for an hour and drain well. 4. Grind together with the red chillies and keep aside. 5. Add enough salt and mix well. 6. Steam cook this in an idli cooker and remove. 7. Cool and crumble it well. 8. Heat oil in a pan. 9. Fry the tempering ingredients for 30 seconds. 10. Add the coconut, crumbled dal mixture and mix well. The filling is now ready. 11. Gradually pour 3/4 to 1 cup of hot water to the rice flour. 12. Mix to a chapati dough consistency. 13. Make small balls of this and shape them into small cups. 14. Add 1 or 2 tsp of the dal filling and fold them well. 15. Steam cook these in a greased idli plate for 10 to 15 minutes. Feel free to comment or share your thoughts on this Uppu Kozhukattai Recipe from Awesome Cuisine.